Are you well into your pregnancy already and driving has become uncomfortable? If you are like most pregnant women, you are either pulling the lap portion of the seat belt down and holding it with your thumb. Or worse, you aren’t wearing a seat belt at all. 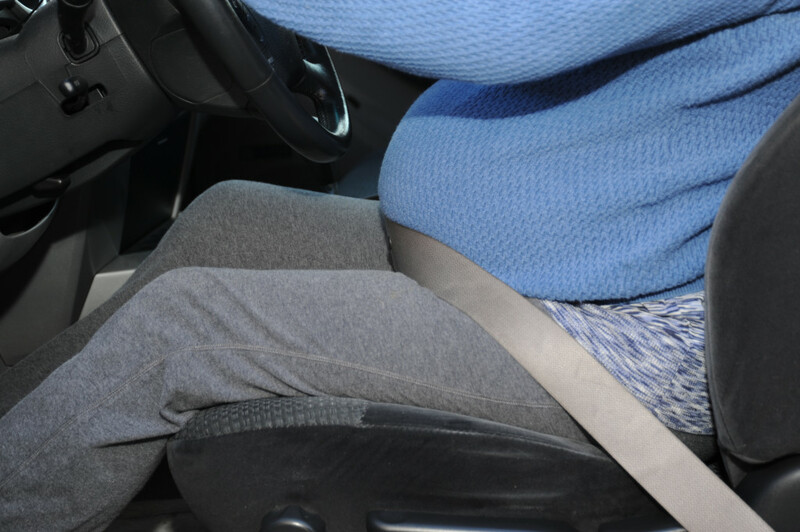 If you are pregnant and you drive, to-date the only advice you will be given is, “Never place the belt over the abdomen, belt should be placed low, across the hips and over upper thighs. It must lie snugly over the pelvis.” This critical recommendation has proven to be nearly impossible and studies have shown that while driving the seat belt often moved up to rest on the abdomen area. The Tummy Shield™ is your solution to seat belt discomfort. This seat belt positioning device for pregnant women takes the lap portion and moves it down to wrap your thighs instead. Not only is it more comfortable, it also is safer for mom and baby. What About Wearing a Dress or Skirt? When I was pregnant I was probably most comfortable wearing dresses and skirts so when I heard about the Tummy Shield I wondered how it would fit and would it be comfortable in a skirt. Lucky me the first time I saw it, I was wearing a skirt so I could try it. Since we decided to carry the Tummy Shield, we took some pictures of it in use with a couple of different skirts to depict varying lengths and fabrics.